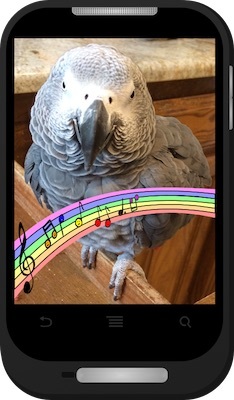 My ringtones are available for purchase in my Etsy Store for $1.99 each and will benefit parrot rescue organizations. I’m offering two different file downloads. Mp3 will work for most phones, m4r will work for iPhones. After you complete your purchase on Etsy, you will download the file to your computer, then you will have to refer to the instructions for your phone to get them to your phone. Look at You! You’re All Wet! Sweetie, know what? Eat your corn!